Fave Food: Anything Thai – i love fresh fragrant food. Fave TV Series: Peaky Blinders or Power, i really can’t choose between them. Hobbies: The gym is my biggest hobby, it is my escapism from everyday life. Pastimes: Dog walks are most defiantly my fave past time, it is something that can be done anywhere, with as little or as many people/dogs as you wish! Red or White Wine: Red all the way! Spanish Tempranillo is my wine of choice. 3 Famous Guests for Dinner: Alan Carr for the pure lol’s that he would bring! Sir David Attenborough in my eyes one of the true greats to ever of walked this earth, i could listen to his knowledge of our worlds animals for ever! Holly Willoughby she would be a lot of fun and in my eyes a real woman, not to mention she is fully Gorgeous! Tea or coffee: Coffee all the way! Current love is a Coconut Latte. Bacon sarni or Kale Smoothie: Is this even a real Question! !……….BACON of course! I couldn’t live without? My iPOD, music has it’s place in every aspect of life. How long have you been a member of the Armoury? From the very beginning! 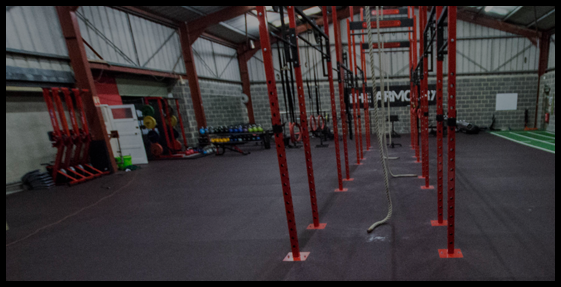 What Exercise did you do before joining the Armoury: Bootcamps, Spin classes, beach runs and was a member of a Gym in Bournemouth. What is your Favorite Olympic Lift: It has to be a Clean, I’m currently stuck at 60kg but with a clever bit of programming from Jonny @ ForgeFitness I hope to conquer that. Least Favorite exercise: I’ve said it once and i will say it again…. BOX JUMPS!! How often do you train: I train 5 days a week with Tuesdays and Sunday’s being my rest days. I do a mixture of CrossFit classes, personal programming, Spin classes (sprint) and Pilates. I train both up here at the Armoury and at a Gym in Bournemouth where I live. I feel it is important to vary the type of exercise I do as I for one can get bored quickly. On Sundays I like to go for a long Dog walk to revive both body and mind, exercise does not always mean pushing your body to the absolute limit. What music do you like to train to: CrossFit/HITT style training has to be DnB. Training goals for 2018: I’m really trying to focus on improving my Olympic Lifting at the moment, which is something I really enjoy. Also to maintain the variety of exercise I have created so far this year. Fave thing about the Armoury: The friendly atmosphere at the Armoury is great. Although to anyone first walking into the gym, all the “scary” looking equipment may come across as intimidating, it really is not at all! We are lucky to have some of the best coaches around and by far the best equipment in the area!! I feel very lucky to be a part of this ever growing community. What would you say to anyone who is thinking of becoming a member: 100% go for it – you will not look back! It is a great place to meet new friends and be inspired. Not to mention exersise is hands down the best thing for your mental health, this I feel is something we massively neglect as a race. So pack your gym bag and come and see what its all about, look forward to seeing you in the near future!